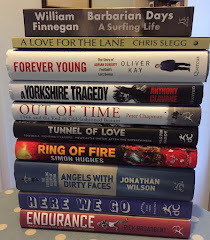 If you are looking for gift ideas for a sports-loving reader in your life, don’t just take The Sports Bookshelf’s word for which titles are likely to be well received from the choices on offer this Christmas. At this time of year, book suggestions make popular subject matter for newspaper columnists. For instance, UK daily The Independent devoted a whole section to the best books for Christmas across a range of genres, with sport put in the spotlight by Chris Maume. He is also impressed with the ever-insightful Simon Barnes -- another Times man -- as he names the 50 sportsmen or women he has most admired in A Book of Heroes: Or a Sporting Half Century (Short Books), which Maume describes as “a romantic selection,” in which “most of the consensually feted postwar idols are there.” But, he adds, not all are obvious choices. Among the cricket books that caught Maume’s eye are Blood, Sweat & Treason : Henry Olonga, My Story (VSP), which tells the story of what followed after Olonga and his Zimbabwe team-mate Andy Flower took their lives in their hands by donning black armbands during the 2003 Cricket World Cup to signify the death of democracy in their homeland. Maume joins the chorus of applause for the unlikely William Hill Sports Book of the Year contender Blood Knots : Of Fathers, Friendship and Fishing (Atlantic) in which Luke Jennings, dance critic and novelist, constructs a memoir of his English middle-class childhood around an obsession with fishing and which Maume says rivals Hamilton’s work as “the best-written book of this year’s bunch”. He also nominates Catrine Clay's Trautmann's Journey: From Hitler Youth to FA Cup Legend (Yellow Jersey Press) for “fleshing out beautifully” the story of the Manchester City goalkeeper famous for winning the FA Cup with a broken neck and hails Brian Moore's autobiography Beware of the Dog: Rugby's Hard Man Reveals All (Simon & Schuster) as a worthy winner of the William Hill award for being “a compelling read from the early revelations of child abuse onwards”. To buy any of the titles listed, click on the pictorial or text links to purchase securely from Amazon. For more sports books for Christmas, see The Sports Bookshelf selections for Football and Cricket or visit The Sports Bookshelf Shop.